Dengue Fever Pops Up In Florida : Shots - Health News Dengue fever was commonplace in Florida until the 1930s. Air conditioning, window screens and better mosquito control helped break the dengue cycle. Now the mosquito-borne illness is back. 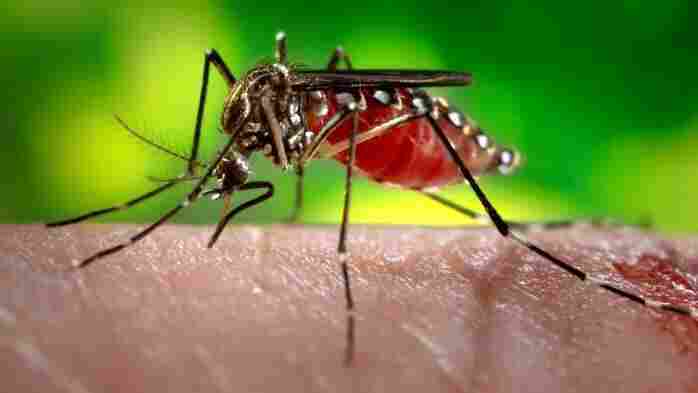 An Aedes aegypti mosquito, a common carrier of the virus that causes dengue fever, feeds on a unfortunate human's arm. Dengue fever, a mosquito-borne illness, is back in Florida. A handful of cases have been confirmed in Martin and St. Lucie counties in the past week. The cases there prompted a public health alert. Another case was seen in Miami-Dade, where officials issued a mosquito-borne disease advisory. Dengue was commonplace in Florida until the 1930s. Air conditioning, window screens and better mosquito control helped break the dengue cycle. 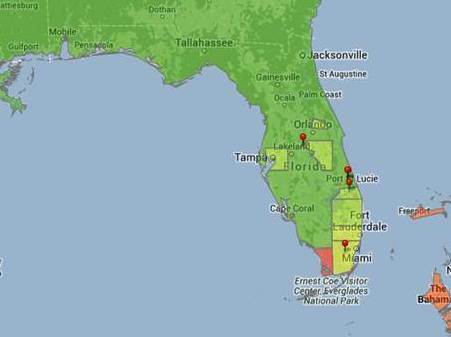 Dengue fever cases have cropped up in southern Florida. But in 2009, things changed. A dengue outbreak in Key West sickened at least 28 people. Investigators found that about 5 percent of 240 people they tested around Key West showed signs of having been infected by the virus that causes dengue. Dengue is marked by fever, headache and pain in muscles, joints and bones. The illness can be excruciating. But infections can also be mild. Those can go overlooked or be confused with the flu. A blood test can conclusively diagnose dengue. Since the Key West outbreak, doctors and public officials in the state have been on guard. "We have better surveillance," says Carina Blackmore, interim state epidemiologist at the Florida Department of Health. "We believe we're picking up dengue that was occurring." Earlier this year, a scientific paper suggested that dengue cases have been significantly underestimated worldwide. Florida officials said people should wear mosquito repellent, protective clothing and be on the lookout for standing water around their homes. Draining it can keep mosquitoes from breeding. The location of cases is also helping guide mosquito control efforts, Blackmore tells Shots. It's one reason that people who are suspected of dengue should be tested.